Unlike competing tablets, your Microsoft Surface lets you create separate accounts for different people. That lets several people use the same Surface, with all of their information stored separately on their individual accounts. Separate accounts make it easy to share a Surface among a family, for example. You can even set up limited-access accounts for children. Even if you’re the only person who will use your Surface, you may want to set up a second account for the inevitable friends who need to check their e-mail. Microsoft account: This links your account with Microsoft, letting you download apps and use many of Microsoft’s services. If you own a Surface, you want a Microsoft account. Local account: Local accounts are fine for simple work, letting you browse the web and create files using Word, Excel, PowerPoint, and One Note. But you can’t download any apps from the Microsoft Store without typing a Microsoft account and password, and many of the Surface’s bundled apps require a Microsoft account, too. Guest account: This handy temporary account gives you a way to let a friend borrow your tablet for a quick e-mail check without giving them access to any of your files. 1From any screen, fetch the Charms bar and tap Settings. Swipe your finger inward from the screen’s right edge and then tap the Settings icon. The Settings pane appears. 2Tap the Change PC Settings link. The PC Settings page appears. 3From the left column, tap Accounts to see the Your Accounts page. The PC Settings page’s Users section appears. 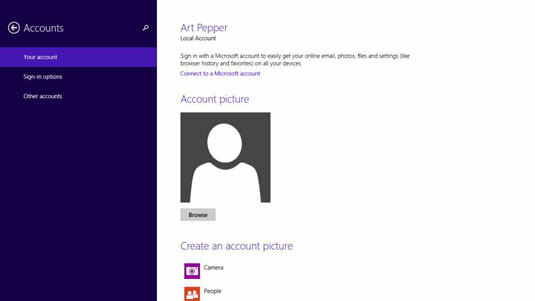 4If you have a Local account and want to create a Microsoft account, tap Connect to a Microsoft Account. 5If you want to create a Local account, tap Other Accounts from the Accounts pane along the screen’s left side. Then tap Add a User. When the How Will This Person Sign In? page appears, enter the new user’s Microsoft account e-mail address, if the user has one. The How Will This Person Sign In? screen makes it clear that your Surface prefers each account to have its own Microsoft account. If you know the person’s Microsoft account e-mail address, type it, click Next, and move to the next step. If the person you’re adding doesn’t have a Microsoft account e-mail address, or you don’t know it, tap Sign In Without a Microsoft Account at the bottom of the page. That takes you to a page where you can create a Local account by typing the new user’s name and a simple password. 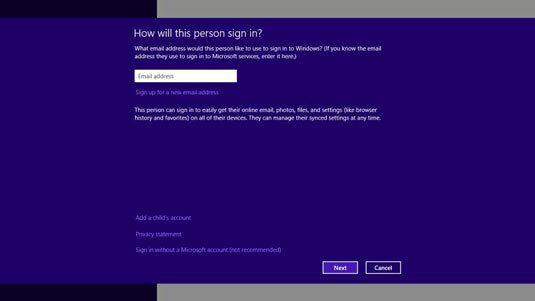 Whether you create a Microsoft account or a Local account, that account’s name then appears on the sign-in screen the next time you sign out of your account or turn on your Surface. Family Safety offers a way of monitoring the behavior of account holders by restricting the websites they can view, the programs they can access, and the time they can spend on the computer. To turn on the Guest account, fetch the Charms bar by sliding your finger inward from the screen’s right edge, tap the Search icon, and type guest account into the Search box. Then tap the Turn Guest Account On or Off link. When the Manage Accounts window appears, tap the Guest account icon and tap the next page’s Turn On button.